Welcome to my « Clear Your Shelf » Giveaway! It is hosted by Kathy @ I am a reader, not a writer and it runs from Friday, June 15th to Wednesday, June 20th 2012. All books are paperbacks in perfect condition. To enter please fill in the contact form below with your name, email and the book you wish to win. Please state if you’re a blog follower (by email or RSS feed) or a Twitter follower or if you like my page on Facebook, as this will grant you an extra entry. For official giveaway rules and guidelines please consult the I am a readre not a writer page. 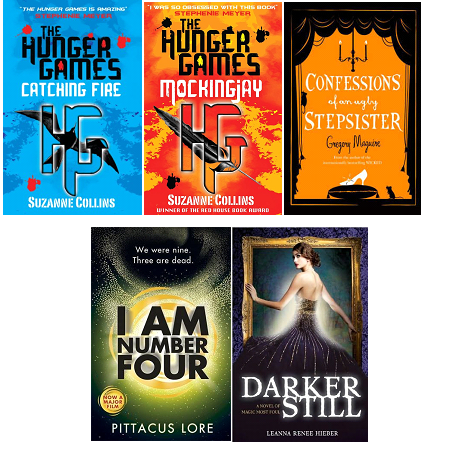 This entry was posted in Uncategorized and tagged Confessions of an Ungly Stepsister, Darker still, EM Castellan, fantasy, Giveaway, Gregory Maguire, I am Number Four, Leanna Renee Hieber, Pittacus Lore, Suzanne Collins, The Hunger Games, YA Books, Young Adult literature. You’re welcome Evie! I live in the UK and I get frustrated by giveaways that are “US only”… Thanks for entering and good luck! Thanks so much for this chance to win! And again THANK YOU for making it international!